My last post highlighted ways to use social media to advocate for your library. However, I realized quickly that I still need to post WHY you should start connecting your library to social media accounts. I often hear educators and librarians say, ” I don’t want to use Twitter.” “I don’t want my students on those types of accounts.” However, if we don’t show them how to do it, who will? Students are surrounded by negative social media. 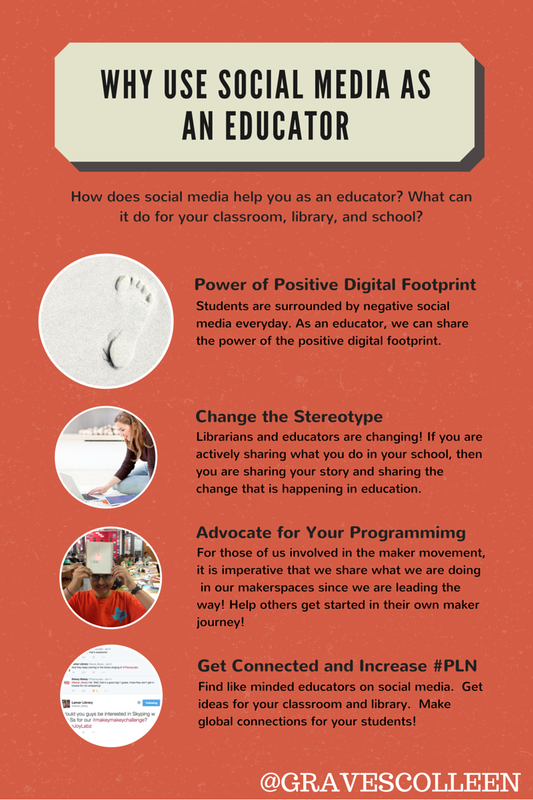 Let’s model the power of the positive digital footprint. Because of my Twitter account, I’ve been asked to present, asked to write articles, made friendships with powerful educators, and even been contacted about writing a book! Librarians are awesome. You guys are all doing awesome things! Share it! Show the world that we don’t shush people anymore. Show the world that libraries are changing and are VITAL to our communities! Social media allows me to advocate for my space. My principal knows what is going on in the library and comes by to visit often to see in person the things I tweet about! It’s also a great way to get all kinds of community members involved. If you show you have a great library program, it’s usually a little easier to ask for funding when you need it. Really. ^^THIS IS EVERYTHING!^^ I can’t imagine a school year without my awesome #PLN on Twitter. I grow because I learn from them everyday. Twitter allows me to find like minded educators and get great ideas for my makerspace! Great quote from Ivey Carey about not utilizing social media… Who are we missing? Need even more info on Twitter? Check out Andy Plemmon’s posts on Expect the Miraculous and how he embeds Twitter to share his library story!